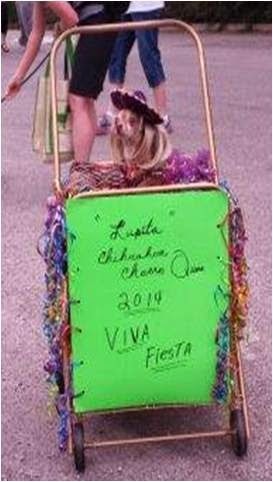 Our neighbors dress up their pets, and sometimes themselves, to celebrate the Fiesta festival San Antonio has each year. The Pooch Parade is the last Saturday at the end of Fiesta. There is a judging walkway to show off some of the pets with their parents to win prizes. Then even more of our neighbors parade their pets through the neighborhoods to show them off, down as parade path. This is our first year at this, we prepared 300 of our reusable bags with goodies such as Fromm, Wellness, and Nature's Variety food samples. We include frisbees, can lid covers, tennis balls, bracelets, and measuring cups from our vendors in the bags. The first 300 were passed out in one hour, and then after that we passed out 300 more unfilled bags!